How often do we look back and think, if only we knew then what we know now? I know I’ve done that numerous times in my life and can imagine a few politicians who might be doing it right now, too. We call it 20-20 hindsight. In the Lake Tahoe region, the Tahoe Prosperity Center is hoping we can use our 20-20 hindsight to avoid future problems that impact our community, our economy and our environment. If we look back to the heavy economic growth years of the late 1950s through early 1980s, there were new motels, strip malls, housing developments and businesses added to our small towns. Our local population grew with that expansion and there was short-term economic prosperity. However, with 20-20 hindsight, we now know that we harmed our environment with over-development and lack of environmental protection. Lake clarity declined significantly. Critical watersheds were damaged and forests and trails were eroded. Local organizations and activists acknowledged that problem and new environmental regulations were put into place to reverse the environmental decline. In 1997, a national focus was added to that effort with the visit of President Clinton and Vice-President Gore. That began a twenty-year focus on reversing Lake Tahoe’s clarity and improving our environment. We have seen much success as lake clarity has improved and our environment is healthier in many ways. But, now that we look back on the past twenty years, what do we see now that we did not see then? 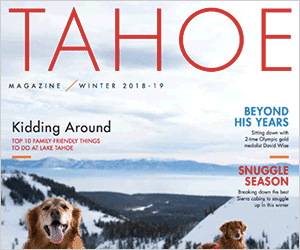 An unfortunate decline in economic prosperity and quality of life for Tahoe’s residents. Our community and economy have suffered with that primary focus on the environment. Very little new development and redevelopment has caused housing costs to escalate beyond local wages. Outdated buildings are now blighted. Businesses have closed and families have moved away. Many in our community deal with low seasonal wages, uncertainty of job prospects and struggle daily to make ends meet. Looking back at Tahoe’s history, we now see that focusing solely on the economy or the environment does not help our community. In order for our region to thrive, we must balance the economy and the environment in order to preserve our communities for the long-term. History is easy to forget, but the Tahoe Prosperity Center reminds us to remember it when we plan for the future. We should take into account the past when we make long-term planning and policy decisions, because nothing fast happens here. But, the long-term impacts have ramifications for years to come. One way we are doing this is through our Measuring for Prosperity report. This report is the only compilation of regional community and economic indicator data that can help with important planning, policy and decision-making. This report is just one tool to help future planning for our region so that we don’t make the same mistakes of the past. The Tahoe Prosperity Center works hard to ensure that a balance of the environment, community and economy are part of regional decision making. This is especially important when making decisions related to future housing developments, transportation and other critical infrastructure projects. It is also one reason we are working on a Dig-Once policy to install broadband fiber in all future public works, bike trail, utility and road projects. Just imagine if the Tahoe Prosperity Center had been here 10 years ago with that idea — Tahoe would be a super-connected community! Fortunately, we are here now and we will keep working hard for Tahoe’s residents to ensure regional prosperity for all who live, work and play in beautiful Lake Tahoe. As we move into 2017, we hope that you will consider the past as you plan for the future, too. In order to truly have regional prosperity for all — we should all put on our 20-20 hindsight glasses. Heidi Hill Drum is the CEO of the Tahoe Prosperity Center, a basin-wide organization dedicated to uniting Tahoe’s communities to strengthen regional prosperity. Visit tahoeprosperity.org to learn more.